Suriname money is known as some of the most colorful banknotes printed. The Surinamese Gulden was the official currency in Suriname from 1940-2004. During the 1990’s Suriname suffered a period of high inflation leading to currency reform in 2004. On New Years Day in 2004 Suriname replaced the Gulden currency with new Surinamese Dollars making the Gulden an obsolete currency. The Millennium “bird series” Gulden was printed in the year 2000. It was the last Suriname Gulden banknotes ever printed. 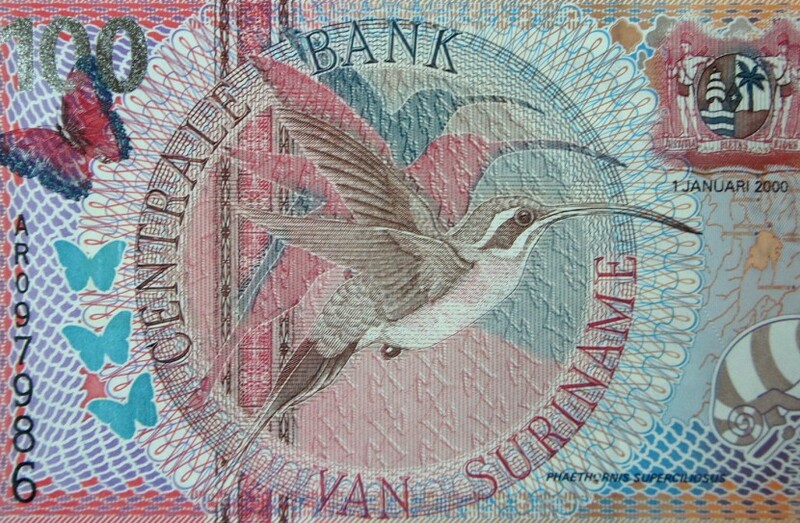 The rare Year 2000 Suriname 100 Gulden banknote features a Hummingbird image on the front. The 2000 Suriname 100 Gulden is a lasting collectible of an obsolete currency and the millennium in a portrait of a Hummingbird! The 100 Gulden is far rarer then the more common 5,10, and 25 Gulden in the series. The note is dated 1 January 2000! Buy this and other banknotes in my ebay store!